Discussion in 'Rebuilds and restorations' started by IbanezDan51, Apr 28, 2016. And hopefully this one won't live a short life as I've used up all my luck. Great to see you back. Have you acquired a zed yet. That's why I'm back Johny, just put a deposit on an amazingly solid example. Looking forward to being part of the club again. ...........just put a deposit on an amazingly solid example. Not the brown one at Galliers? Which is now ended on eBay I see? If so, ####!!!! I was going to call him tomorrow about that! It's a brilliant project car. I saw it back before Xmas. If it hadn't of been for my Dad falling ill and killing any interest I had in getting involved in a project at the time, I'd have bought it. I didn't realise he had it still until I spotted it on eBay earlier. Clearly I need to be more decisive. It is indeed Richie, couldn't believe how clean it was despite the paintwork! Welcome back dude!!!! Can't wait to see the car and you in the flesh. So good to hear your little bit of "drifting" didn't put you off the Z scene. And, better still that you picked up a car Richie was after - shows you made an excellent choice. Looking forward to the pics when you have her. To quote Johnny Palmer last Sunday at Silverstone "you like your standard car for the same reasons as I like my American cars". Beats all those hours of welding Dan. And, better still that you picked up a car Richie was after - shows you made an excellent choice. Steady on - I wouldn't go that far. The end of my week has been ruined! Dan, I was going to ask what you'd got in mind - what you've said sounds pretty good. It's such a great shell that really a bit of tidying up, new exterior paint (I would probably have kept it the original brown as the paint inside and in the engine bay is still good), maybe adjustable suspension and good wheels would be more than enough. Although I would've been buying it to drop my stroker in it! Of course, if you really still find yourself lacking in inspiration for what to do with it, I'll be more than happy to take it off your hands! Strip and re under seal. Freshen up the engine and replace worn parts as and where needed. And get the car painted. Oh, and I realized there's a welding opportunity on the car if you want one (although easy to replace) - the RH door window frame has snapped at the top corner! I have sold or scrapped a lot of standard parts I wish I'd kept. The problem is storage. Yes Rich it is indeed broken! So I'll either source a replacement or repair that one, looked quite a simple fix - just need some more stainless wire. 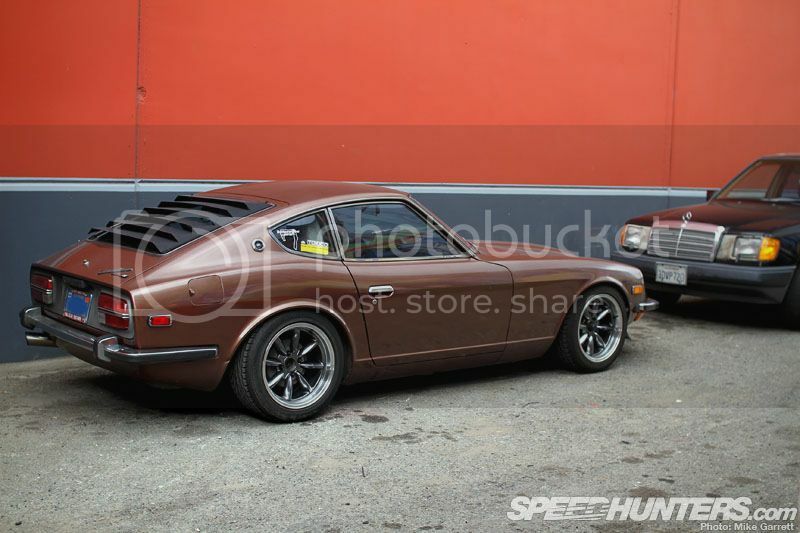 That picture is what made me want to return my black zed to its original brown. even thought about a standard RB25 to go in it, the same as that car.